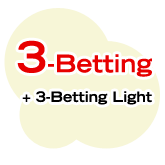 3-betting light is an advanced concept that adds an extra weapon to a game that has likely become repetitive and stagnant, even if that current game strategy is winning you money at the tables. 3-betting will shake up a mid-stakes player's game about as much as the continuation bet did when you first found out about that when you were starting out. This concept is going to be most useful in mid-stakes games between $50NL and $200NL. When and where to 3-bet light. First of all, what is a 3-bet before the flop? A 3-bet is when there has been a raise and then another raise after that. Simple enough, but let me give you one quick example to drive it home: After the SB and BB post the $1 and $2 blinds, lets say there is a raise to $8 from a player in MP. If another player in LP raises it again to $24, this is called a 3-bet. For a quick guide to good 3bet sizing, watch the 3betting section starting at 13:39 in this bet sizing video. As you can imagine, the guy (or girl) making the 3-bet probably has a very good hand. You would normally expect them to be holding something like QQ+ or AK to make this second raise before the flop. You might be wondering why it's called a 3-bet if there has only been two raises. Well, the BB is actually considered to be a bet in itself, and so the first raise is the 2nd bet and the second raise is the 3-bet. As mentioned, you would expect the player making the 3-bet to have a very strong hand like QQ+ or AK. Therefore, 3-betting light is when you make a 3-bet with a less than premium hand like 67, 78 or any suited connector like that. 3-betting light is where you make a 3-bet with a less than premium hand before the flop. Seems crazy and dangerous I know, but I'm sure you thought the same thing when you first heard about continuation betting. 3-betting light can be an incredibly +EV move when used correctly, so don't underestimate its strength. Players these days will make preflop raises with a wide range of hands. If a player makes a raise before the flop in LP, they could have almost any hand under the sun. That's how all decent TAGs play. Calling these raises with a strong hand of our own (or even with a drawing hand like 78s) puts us at a disadvantage because our opponent will have the initiative in the hand. When the flop comes, we are only really looking to fold unless we hit top pair or better. Even then, we are not going to feel great about our hand. 3-betting when in position will regularly put loose raisers in a position where it is -EV to call a 3-bet because of their wide opening range. Not to mention taking away their initiative. Players open with a wide range of hands, which means calling 3-bets is -EV for our opponents. 3-betting can often be far more +EV than just calling in some cases. Players almost always fear AA when they face a 3-bet. This gives us tremendous leverage for the flop (so cbet!). You take back the initiative in the hand. Opponents will call you down with much weaker hands in future if they see you 3-bet so lightly (metagame strategy). Sure, making an extra reraise before the flop is going to be pretty damn scary, especially if you are 3-betting light. However, if its going to be a +EV play you need to show some balls and play in the way that is going to make you the most money. Don't get me wrong though, 3-betting light isn't just to try and punish the loose raisers and hope that they fold. There will be times when we get called when we 3-bet light, but that's not a problem. There are still advantages to 3-betting light when we reach the flop. So we've discussed the advantages of the simple 3-bet, but when should you 3-bet light? You want to 3-bet light with mid connectors/suited connectors like 67, 78 and 89, or 1 gap suited connectors like 68 and 79. You should 3-bet light in position. 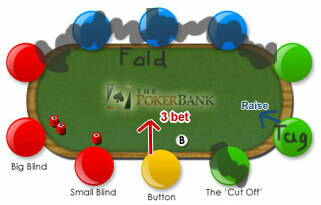 Playing a 3-bet pot out of position is tricky (although not impossible). You should mostly 3-bet raisers from LP. Raisers from EP are more likely to turn up with a strong hand. You should try 3-betting light against TAG (Tight-Aggressive) and semi-TAG players. An optimum spot to 3-bet light is when a TAG from LP makes a raise when you are on the button or in the CO.
How a good 3bet will usually play out preflop. Apologies for the God-awful diagram, but you should get the idea. These sort of players are likely to be raising with a wide range of hands in this position, and so are fully capable or folding when they come up against aggression. This is why 3-betting gives us an edge. Super tight and are only going to raise with supreme hands. Hence our 3-bet definitely gets called. Super loose and will call regardless. We lose all of our fold equity in the hand with these players. This is not the only ever spot that you can 3-bet, but if you keep these guidelines in mind you should be able to get a feel for when it's a +EV spot to 3-bet. In a nutshell, when you 3-bet light you ideally want your opponent to fold. This gives you an instant and nicely-sized pot and will usually force your opponent to tighten up the hands they open with from late position. If we get called and miss the flop, we are almost always in the perfect situation to make a continuation bet and take down then pot. So don't be afraid to make that cbet, it's a +EV move over the long run. That's the basics of it, but allow me to explain a little further. Hands not to 3-bet light with. What to do on the flop if you are called. The type of hands that you do not want to 3-bet light with are lower tier broadway hands like; KQ, KJ QJ and also weaker aces like AJ (definitely not rag aces either). The problem is that if you are 3-betting with these cards, the hands that your opponent is going to call with are going to have you dominated (e.g. AQ+, JJ+). However, if you have a lower suited connector like 78s, you still have two "free" cards that you can do damage with. It also makes post-flop play easier as you are less likely to get tied in with a marginal hand where you hold something like top pair weak kicker. Stick to 3-betting premiums (QQ+, AK) and lower suited connectors (56 - 9T) only. You are better off calling with less than premium broadway hands rather than 3-betting with them preflop. If you miss the flop, make a continuation bet of about 2/3 the size of the pot. Simple as that. A pot size bet is unnecessarily large in a 3-bet pot. 2/3 does the job and saves us money for when it doesn't work out. The beauty of 3-betting is that it gives you supreme power in the hand. Your opponent is always going to have the fear that you have pocket Aces or pocket Kings at the forefront of their mind, so take advantage of that fear. If on the odd occasion you get called, check/call on the turn and be done with the hand. The majority of the time a good continuation bet will work wonders though. If on the other hand you catch a piece of the flop but nothing worth value-betting, checking and calling may be the best option. However, a lot of the time you are going to either have a strong hand or nothing at all, and in both of these situations you will want to cbet. Our opponent here clearly made a poor call when we 3-bet, as we represented a very strong hand like QQ+ or AK, so the chances are that he called with a hand like AJ+ and hoped for the best. Even if our opponent did hold a hand like QQ or AJ, it is very difficult for them to call for the fear of us holding Aces or Kings, which is why the continuation bet brings home so much money due to the 3-bet before the flop. This article is one of the longest I have ever written, yet I still feel that it could have been a bit meatier. Congratulations if you made it this far, and I hope most of it made sense and you can understand the theory behind 3-betting lightly and how it can be profitable. Just be sure not to abuse 3-betting and you will be fine. 3-betting and 3-betting lightly can be very +EV in the right spots, but they can do a lot of damage to your stack if you are not careful with them. I'd recommend dropping down a level to experiment with 3-betting and to find your feet with it. It's definitely a skill that is worth perfecting and adding to your game as a mid-stakes player (or for when you reach those levels). PS. Don't forget to cbet if you miss the flop. SplitSuit's When 3Bets Go Wrong (pt. 1) video looks at 9 different hand histories where Hero's 3bet gets called (or when another player 4bets). It's an excellent strategy video for playing in tricky 3bet spots.